Pound for pound king and boxing's crossover superstar winds down training at Freddie Roach's Wild Card Gym on prior to taking a drive to the MGM Grand in Las Vegas for his upcoming World Welterweight mega fight against "Sugar" Shane Mosley on Saturday, May 7 at the Grand Garden Arena of the MGM Grand. Pacquiao vs Mosley is promoted by Top Rank in association with MP Promotions,Sugar Shane Mosley Promotions,Tecate and MGM Grand. 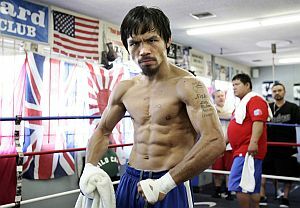 The Pacquiao vs Mosley telecast will be available live on SHOWTIME Pay Per View. In the Philippines the fight will be available on pay per view "live" with no commercial interruptions over Cignal TV as well as the premium channel of ABS-CBN's Sky Cable. It will also be telecast on the global network -The Filipino Channel - in the Middle East, Europe and Australia. GMA 7 and Solar Sports will also telecast the fight on Sunday, Manila Time.